In 1565, forty-two years before the founding of Jamestown and fifty-five years before the Pilgrims landed at Plymouth Rock, a Spanish conquistador named Pedro Menéndez de Avilés established the city of St. Augustine. It was a small frontier town, subject to hurricanes, pirate invasions, and Native American attacks, but it has managed to hold on for almost 450 years. Vital to the ancient city's survival was the imposing Castillo de San Marcos. After enemies and the elements destroyed a series of wooden fortifications, construction began on the stone fortress in 1672. 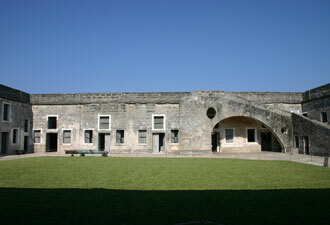 Built from a unique local limestone called coquina, the Castillo was a fortified warehouse in which the townspeople stored enough food, gunpowder, and ammunition to outlast a siege of at least two months. It was also where they found refuge from enemy attacks. In 1702 the English trapped more than 1,500 people inside for fifty-one days! Despite lengthy sieges and bombardments, no enemy ever managed to take the Castillo by force. The fort never fell in battle, but that doesn't mean it has never seen change; the only constant in the Castillo's history seems to be change. Through treaties and negotiations, the Castillo changed hands between countries numerous times. Built by the Spanish, in 1763 it was turned over to the British who renamed it Fort St. Mark. It reverted to Spanish control in 1784 and regained its former name. In 1821, the United States occupied the fort and renamed it Fort Marion. It remained a US Army fort – except for 13 months during the Civil War — until 1899. It has been used as a storage facility, barracks, a prison, and even as a Coast Guard training facility during World War II. One thing that never changed is its standing as a testament to the ability of people to do great things to defend their homes. 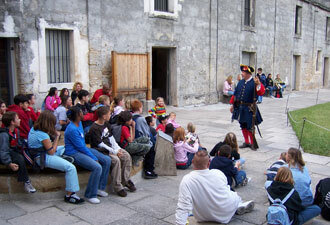 Today, you'll find many ways to experience the stories of the people who lived and fought in St. Augustine. The fort is a museum with displays and exhibits throughout its rooms and a self-guided walking tour to lead you through the past. A 25-minute movie shows how soldiers relied on historic cannon and muskets. Ranger programs give a deeper understanding of the Castillo and its people, and cannon firing demonstrations scheduled every Friday, Saturday, and Sunday show an important tool at work. 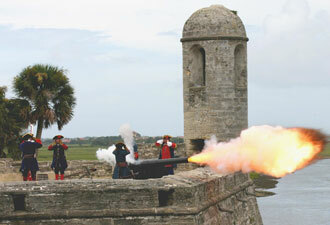 The Castillo is not the only place in St. Augustine that tells the ancient city's unique history. Many other museums and historic homes illuminate this story, including Castillo's sister park, Fort Matanzas National Monument. Little-known snippets of American history lurk around every corner in this town, and a history-lover is never without something wonderful to discover!